Irrigation, industrialization and population increase all make demands on the supplies of fresh water. 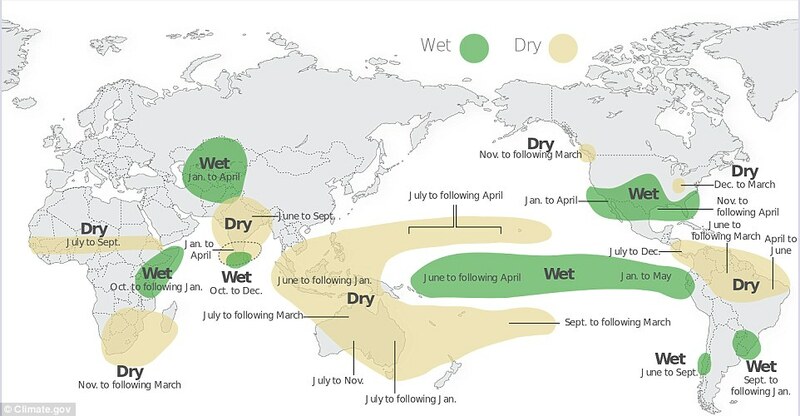 Global warming may disrupt rainfall patterns and water supplies. The hydrological cycle supplies humans with fresh water but we are withdrawing water from underground aquifers and degrading it with wastes at a greater rate than it can be replenished. In this unit we will look at the increased demand for fresh water, inequity of usage and political consequences, methods of reducing use and increasing supplies. This unit is 3 hours. Many horological cycles cross international boundaries. How does this affect the management of water? Can agriculture, deforestation and urbanization allow for the natural functioning of the hydrological cycle? In what ways may population growth and human activities have an impact on the hydrological cycle of the future? ​Earth's water is in constant motion as water at the surface exchanges places with the gaseous moisture and water droplets found in the atmosphere. As the sun warms the Earth, liquid water found in lakes and oceans on the planet's surface evaporates. Moisture within the atmosphere eventually cools and condenses, until liquid water or snow falls back to the Earth as precipitation. Runoff from rain eventually finds its way back to lakes and oceans, completing the most direct version of the water cycle. Only a small fraction (2.6% by volume) of the Earth’s water supply is fresh water. Of this, over 80% is in the form of ice caps and glaciers, 0.6% is groundwater and the rest is made up of lakes, soil water, atmospheric water vapour, rivers and biota in decreasing order of storage size. Precise figures are not required. The water cycle is dynamic and always active, but that doesn’t mean every molecule of water is constantly moving through the system. 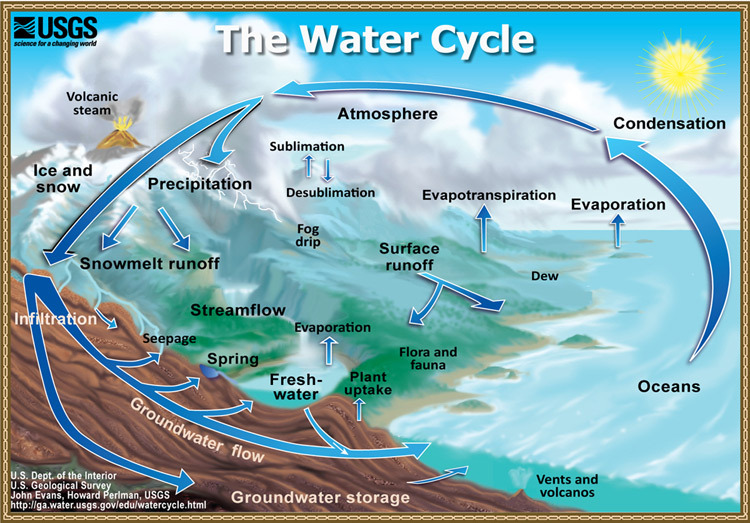 In fact, water is stored in various parts of the cycle, often referred to as reservoirs. These might be as large as water in the oceans, or, on a smaller scale, water can be ‘trapped’ in an iceberg or a lake. Much more water is in storage than actively moving through the water cycle. ​How long water spends in each reservoir is called ‘residence time’. These are some estimated average residence times, but it’s important to remember that some water will spend much longer or shorter time than this. As water moves through the cycle, it changes state from liquid (rainwater, seawater) to gas (water vapour) and back to liquid. Liquid can also freeze and become solid (ice or snow). This natural process removes some of the water’s impurities, constantly refilling Earth’s fresh water supplies – it is our planet’s way of recycling water. Evaporansportation - water evaporates from plants, mainly through their leaves. This gets water vapor back into the air. Sublimation - the conversion between the solid and the gaseous phases of matter, with no intermediate liquid stage. Used to describe the process of snow and ice changing into water vapor in the air without first melting into water. Evaporation - the process of changing water from liquid to gas. Only fresh water makes its way up to the clouds, as ocean water leaves behind salt, minerals and metals when it evaporates. Condensation - the process of changing water from gas to liquid.. As water vapour rises, it becomes cooler and changes back into tiny liquid water droplets. These merge together to form clouds. Advection - Transport of an atmospheric property by the wind. This horizontal transport or transfer of a quality such as heat and cold from one point to another. Advective transfers occur either in the oceans by currents of seawater or by large-scale movement in the atmosphere where humidity (atmospheric moisture) is another important property. In both cases a major example is the transport of cold air or water masses from the polar regions to lower latitudes. 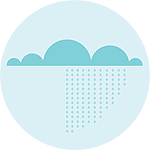 Precipitation - when rain, snow, sleet or hail falls from the sky. Depending on the air temperature, water can take a liquid form (rain), or a solid form (snow, sleet or hail). Deforestation leads to the decreasing of interception and infiltration, because there are not trees to trap rainfall. It is easily to increase the amount of surface runoff and increase the storm runoff in rivers. The erosive power is enhanced by the running water. Because there are few trees, lesser roots of vegetation bind the soil particles. This makes to the increase of soil erosion. Moreover, sediment yields in rivers increase. The river is silted up. Finally, the river is risk to be flooded. This is the result of the raise of riverbed and reducing carrying capacity of the channel. Consider the increased demand for fresh water, inequity of usage and political consequences, methods of reducing use and increasing supplies. A case study must be explored that covers some of these issues and demonstrates either sustainable or unsustainable water use. The demand of water has increased in both MEDCs and LEDCs, as populations are increasing as well as agriculture changing and expanding industry. MEDCs need more water as they wash more often, water their gardens, and wash their cars. Resource managers in the Colorado River Basin are preparing for an unprecedented scenario: By 2015, water in Lake Powell is likely to drop to a level that will trigger mandatory cuts in water deliveries to California, Arizona and Nevada. About 36 million people in seven states and 20 Native American nations rely on Colorado River water, which is collected in reservoirs like Lake Powell. In addition, diversions from the river irrigate 4 million acres of land, producing about 15 percent of the nation's crops. Water deliveries to California, Arizona and Nevada would be cut by 750,000 acre-feet — about 244,500,000,000 gallons of water. An acre-foot of water is about 325,853 gallons, equal to the average annual household use in the U.S. If farmers in Arizona and Southern California have to find more expensive replacement water, it would affect food prices across the country. Many hydrological cycles are shared by various nations. This can lead to international disputes. The hydrological cycle is represented as a systems model—to what extent can systems diagrams effectively model reality, given that they are only based on limited observable features? Julia Roberts, Harrison Ford, Kevin Spacey, Edward Norton, Penélope Cruz, Robert Redford and Ian Somerhalder all join forces to give nature a voice. In this video Paul Andersen explains the vital role that water plays in the processes on the Earth's surface. Water has several unique properties including high heat capacity, transparency, polarity and the ability to change the chemical behavior of the mantle. The Earth is largely a water planet but most of the water is found in the oceans or locked in ice. Water is a powerful erosive force on the planet. The oceans are mostly composed of warm salty water near the surface over cold, less salty water in the ocean depths. These two regions don't mix except in certain special areas. 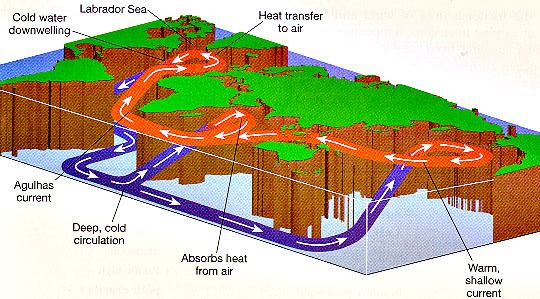 The ocean currents, the movement of the ocean in the surface layer, are driven mostly by the wind. In certain areas near the polar oceans, the colder surface water also gets saltier due to evaporation or sea ice formation. 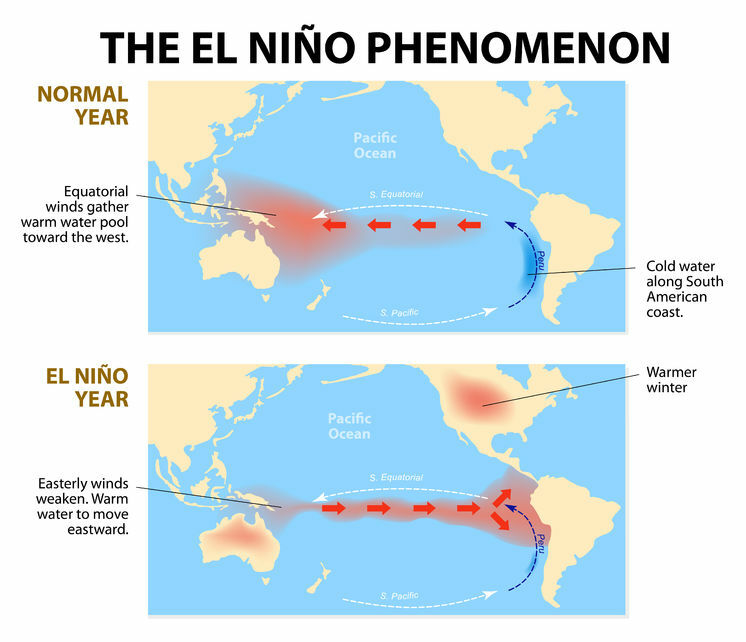 Have you ever wondered what El Niño is? Trace was curious and decided to do some digging to figure out what exactly it is.